Waaside studio during a dance practice. Photo by Dima Tonkiy. Four girls around 20 years old are speaking to each other in the dressing room of the club. They are wearing black and red bodysuits and stockings, sharing a red lipstick and hemming their costumes. In a few minutes they are already on the stage. The crowd is screaming and men cannot take their eyes off them. The girls are gracefully moving on the stage, doing acrobatic elements and flirting with the male audience. Zlata Skrypnik is the leader of this women-only dance team and at the same time the founder of the Waaside dance school in Prague. She is skinny, has blonde hair and smiles all the time. She has been dancing since the age of three. She started with ballet but what she does now is far from the classical school. Female dance styles such as go-go, jazz-funk, dance hall and twerk are not accepted by many people, especially elderly ones; nevertheless, it is extremely popular among girls between 15 to 35 years old. Zlata Skrypnik, the founder of Waaside studio in Prague. Photo by Dima Tonkiy. Why? 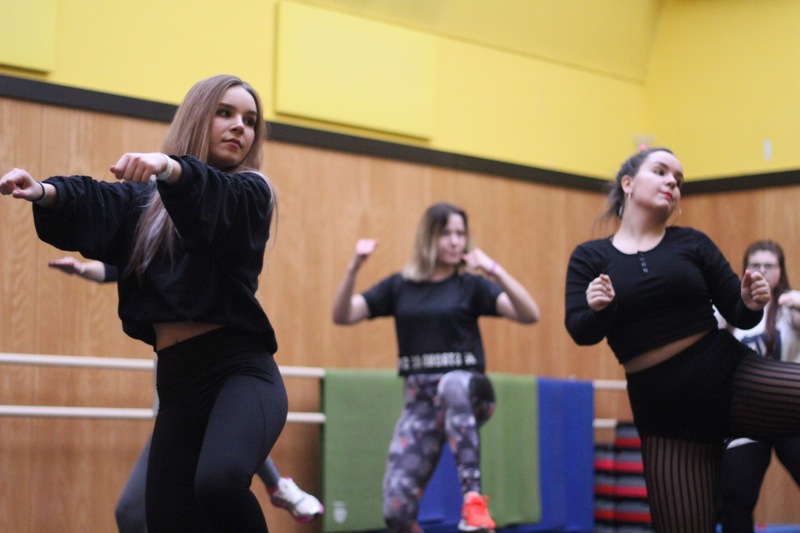 “I enjoy realizing the fact that I can catch people’s attention with only one movement,” Skrypnik says, “that I can dance in a club or even on the street and see admiring glances.” At the beginning most girls go to dance schools for that reason but then they realize that there is something more important. Dancing, which is basically a combination of physical work and actor play, is good for health in both the physical and psychological sense. Dancing is good for the cardiovascular and adipose systems, metabolism and immunity. Different movements make all the muscles work, which helps to keep fit and is good for the posture. “It is possible to lose a kilo of weight during 1-hour training,” Skrypnik says. Dancing improves coordination and strengthens the vestibular apparatus which is the sensory system that contributes to our sense of balance and spatial orientation. It enhances our flexibility in movements. Regular training with complex movements improves brain activity and memory and reduces the risk of Alzheimer’s disease. Dance movements prevent many other serious illnesses. They help to strengthen the hip joints and knees. Dancing also has a psychological aspect for girls. “At the beginning many students feel uncomfortable, cannot relax and even do not look at the mirror. It is a common thing which disappears in one or two months. Then they look much more self-assured. Dancing helps to become more liberated and be yourself,” Skrypnik explains. A person gains harmony, gets rid of stress and tiredness. It is good for those who suffer from depression, fear and self-doubt. Nowadays some psychologists advise their patients to take a few dance classes which can be taken in any dance school. For example, it is a good thing to do for couples who have been married for a long time and have lost interest in each other. “Women may try female dance styles or a couple can go to tango classes together,” Skrypnik says. Tango helps to “allocate roles” for men and women in their relationship. A couple will cope with the dance, only if both partners play their strictly marked roles. “Partners have to feel, absolutely trust and rely on each other. Women have to follow men and realize that there is nothing to be ashamed of when a man is the leader. Tango is a great metaphor for a relationship in which two partners have to become one, they cannot exist in tango separately,” Skrypnik says. In female dance styles there are many movements done with chest and thighs which reveal women’s sexual energy. It helps them to feel more feminine, beautiful and desired. “It is a funny thing but there is a tendency among my students. Many of them after a few months of classes come to me and say that they are pregnant,” Skrypnik laughs. Ten years ago there were no dance schools in Prague in which female dance styles were taught. It has been developing in the USA but not so long ago European dancers came there and then brought these styles to the Czech Republic. Now there are about 20 dance schools for women and in some dance halls up to 100 students can work altogether. An average price for a month of classes is 1,000-1,500 CZK per person. “If you own a school, you may earn around 300,000 CZK a month if the business is successful,” Skrypnik says. Skrypnik has some advice to those who want to start dancing. The first one is not to be afraid of anything. “Life is short and if you want to do something, do it,” she says. Many girls are afraid of dancing in a group because they think they are fat, ugly or clumsy. Skrypnik says that even 100-kilo weight women look great when they know how to move, and it is even more impressive. The second advice is to never give up. “It is not easy to dance, especially to begin, but everything comes with time. Practice makes perfect,” she concludes.